Born in Bolzano (IT), Valeria Merlini is a sound artist, turntablist, DJ and curator based in Berlin. 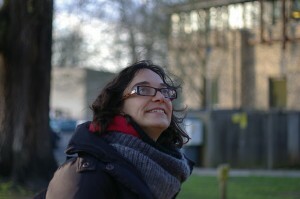 After completing her study in Architecture in Florence, she obtained a Master’s degree in Sound Studies at UdK, Berlin. In her work she explores sounds of the everyday within an urban context through an interdisciplinary and critical approach. She is co-founder of Studio Urban Resonance, is a member of the Italian label Burp Enterprise and co-runs Staalplaat Radio. As a DJ she focuses on experimental electronic music, playing solo and also with several groups, constantly extending the conventions of turntablism, musique concrete, free improvisation and composed music. She was the director of Museruole Festival (IT, 2012) and has participated in numerous events and exhibitions including Berlin Sonic Places (D), Audiograft 2012 (UK), Tuned City (EE), Echtzeitmusiktage 2010 (D), STEIM’s Turntable Night 7 (NL), Audioscoop / IntroInSitu (NL), Das kleine Fieldrecording Festival (D), Avantgarde Festival Schiphorst (D), Soundscape and Listening (AT).